This is just a note to say thank you. I have never told you how much you mean to me. Until now. I did not want you at first. All those years ago, when I first saw you – in the flesh, not just in those glossy pictures on the web that I couldn’t stop gazing at – I was not sure. I didn’t know then that I needed you. I went away. I left you. But I never stopped thinking about you. I was young and indecisive. I came back. I realised you were worth it. You were now mine, and, together, we grew. I kept you for best at first – long, rough, wild days, just you and me. Maybe I thought you could not cope? I was wrong. As the months rolled by, we became familiar. You were not just for weekends; I needed you every day. We did everything together: big and small. You were there the day I ran the Fellsman, 13 hours together in the bitingly cold wind of the Yorkshire Dales, and then – six weeks later – a momentous Bob Graham Round. They were halcyon days, our grandest adventures. I knew every inch of you then. Food in the right pocket; map and compass on the left. Spare clothes in the back. Feeling your gentle press on my shoulders and your arms wrapped around my waist gave me the reassurance I needed. Things will be alright. There were tough times, too. Remember when I refused to pull on my waterproofs on Ben Nevis? I was soaked through. Then there was that excruciating cycle climb up Mont Ventoux. I was too exhausted to notice the view. But putting food in you meant I could put food in me. And what about that mountain marathon in the Borders? You were imbued with the qualities of a Mary Poppins handbag: you carried my life for 36 hours – tent, sleeping bag, stove and gas, clothes and food. The race? Well, it was unrelenting. I hated every moment. But that was my fault, not yours. You carried me. I carried you. And there was more. You held my books as I went from home to work, and back again, hundreds of times, however I went – on foot, by bicycle, by train, by bus. You sat in the bottom of the gig, babysitting the sandwiches, when I rowed the English Channel. You went to hospital when my first daughter was born. And my second. You helped me move house, move country. Do you know what is strange, though? I have never really looked properly at you. We have experienced so much the same but also so much the opposite; for when you look one way, I look the other. I suppose that is why I cannot find a photograph of you. You are there in flashes, of course. A streak of orange or a black strap, but none of just us. I realise now that as I smiled and posed, you were busy. When I look at you now, I see your age. I am sorry to say that. What have you become? Once you were taut and bright. Now your orange patches are sun-bleached and smeared with years of mud flickers. Your reflective stripes are worn at the edges. How old are you now? Eight years? Nine? What has become of the former you – the object of those glossy online images? I look again, beyond the skin, and I see you are the same. Rougher around the edges, yes, but the same. Your inner beauty, your functional brilliance, remains unchanged from the day I first took you home. Yes, I thought. Yes, you do. And there will be more: for we will grow old together. Now you know, I hope, what you mean to me. 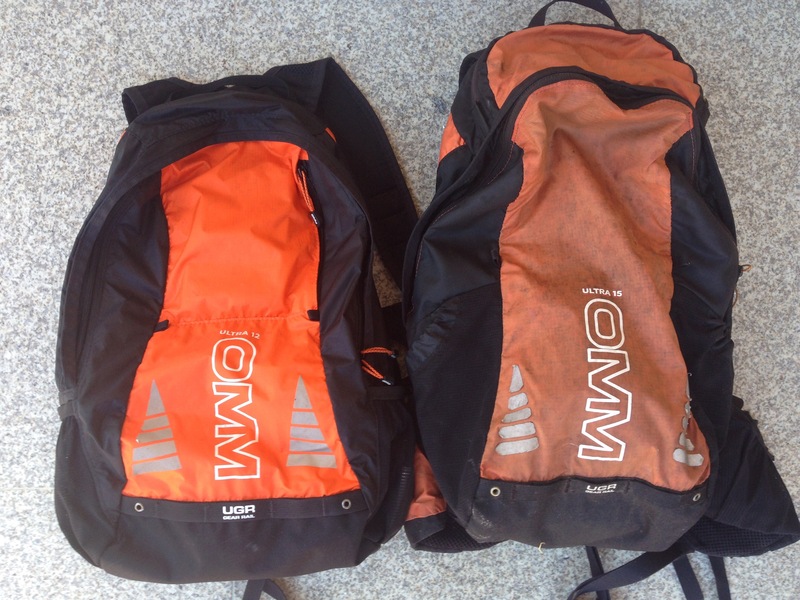 The OMM 15L is a cracking piece of kit. Similarly, mine has accompanied me on runs to and/or from work on most weekdays for several years along with an assortment of ultras, mountain marathons, and so on, and it’s still going strong. It finally required a little duck tape TLC a couple of months ago but I reckon there are another few years of life for the two of us to look forward to together. A reliable yet lightweight workhorse of a running rucksack. In contrast, my flashier and more fancy Inov8 Race Ultra Vest thingy has showed signs of wear and tear after a handful of runs.